The most extreme race I’ve ever done, and the birth of the Kegety — Quirk Cycles | Custom Steel Bicycles Handmade in London by Frame Builder Rob Quirk. 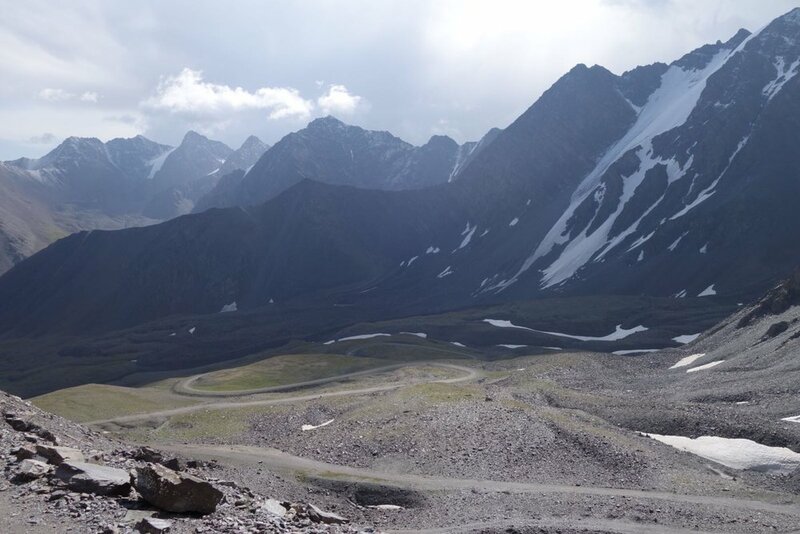 When Nelson Trees, a veteran Transcontinental Race finisher, decided to set up the ultimate self-supported bikepacking race, the isolated country of Kyrgyzstan seemed the perfect fit. Rob and Nelson had shared beers at the finish of the 2016 TCR with Nelson explaining his plan for what he thought would be the toughest bike packing event yet devised, setting in motion a chain of events that resulted in Rob flying to Bishkek in August 2018 with what was to be the basis of the Kegety to compete in the inaugural Silk Road Mountain Bike Race. I’d not heard a great deal of Kyrgyzstan before I sat down with Nelson Trees at the TCR finish line in Çanakkale in August 2016. He described an otherworldly place – a vast expanse of wilderness with few buildings, barely a paved road, a mountainous country with welcoming locals in small villages hidden among deep valleys. He planted a seed in me then, inviting me to ride the inaugural Silk Road Mountain Race, the SRMR, a brand new self-supported bikepacking race he intended to set up. Having proved both my own ability and my theories about bike design in the TCR, I was excited to test out some new designs, ones that would push the absolute limits of what a road bike could achieve off-road. It took another few years for Nelson to have everything in place, and by then I’d convinced my friend and fellow Quirk rider Chris Hall to join me in the adventure. Despite everything we’d researched, it was truly a journey into the unknown, but I was confident that the bike was up to the task. I’d designed it to be stable, particularly off-road, with lengthened chainstays and a slack head angle. With clearances offering ample room for the bombproof WTB Nano 40c tyres, the perfect balance of speed and cushioning, it was ready for anything the country could throw in its way. I’d tested it out at Grinduro Scotland the month before as a taster, but I knew SRMR was going to take things to another level. After leaving the capital, Bishkek, the initial 100km of the course was almost all uphill. Starting at an altitude of 900m, the Kegety Pass reared up ahead to over 3,800m. The bike’s rear end was designed to be short enough for steady climbing, and used smaller diameter tube shapes, which introduced an element of flex to the frame to smooth out the ride on the rough, barely-surfaced roads. It was tough going, very tough. If the Tour de Friends can be described as the ‘glamping’ version of the TCR, the SRMR is right at the other end of the scale. Mile after mile of wilderness, roads that were little more than dried up riverbeds, temperatures fluctuating from almost 40 degrees in the day to -10 at night and with little fresh water available, this was going to test me deeper than ever. Of the 100 starters of the event, only a third finished it, and we covered barely 400km in the first four days – I’d done that on day one of the TCR. Struggling with the altitude on that first day, a snowstorm rolled in and we bivvied for the night before we reached the summit of the pass. Despite the hardship, we could see what had so beguiled Nelson about this place. Watching the sun set between the mountains was a stunning sight; it was truly a beautiful country. I decided there and then to name the bike the Kegety. A race that starts at 900m above sea and climbs as high as 3,800m takes a huge toll on the body. We felt a lot better after a night’s rest, and were thankful we’d saved the summit and descent for daylight. A landslide had obliterated the road and descending was a mix of walking and riding across loose scree. The bike was incredibly stable and the Lauf fork proved itself invaluable on the mix of rock and gravel on which we were riding. A good deal lighter than a standard mountain bike suspension fork, it smoothed out the big hits, and with the higher bottom bracket designed into the frame I was able to glide down the pass. Point this thing downhill and it would fly. The landscape in this valley was completely different: lush green vegetation, yurts dotted around, loose horses galloping about. We were going well now and pushed on over the next pass to a village where we got our first taste of the celebrated Kyrgyz hospitality. We were so drained by now that the sight of bonbons and Wotsits in the village shop lifted our spirits no end. Not that they were as we expected – the bonbons were made of cheese and what appeared to be Wotsits were sweet, sticky, powdery lumps. We eventually got some decent food inside us and spent the night in the village, having breakfast with the family the next morning before setting out once more. Chris seemed to hit a lot of bad luck on this trip and it continued as his front brake, which had lost pressure on the flight, dumped all of its hydraulic fluid on the descent off the next pass. We managed to re-route his rear brake cable to the front, which is the preference if you have only one brake, but in these remote mountains you don’t take chances. One brake wasn’t enough and we walked a lot of the way down. Chris had a cable-guide for the rear brake cable that we’d had to file away to remove it from the frame; it was our good fortune that Chris had a file with him. This experience instilled a practice I’ve carried on into the Kegety design to this day. By placing the brake cables externally and using clip-on attachments, the bike offers far simpler fixes for roadside emergencies, especially when you’re miles from anywhere. We had a tough call to make, but we decided together than we’d have to scratch; you don’t mess about in an environment this unforgiving. My bike had been killing it and it was such a shame that we had to abandon and I couldn’t keep pushing on. But we’d entered as a team and would continue as one. I’d taken the bike to the limits of what road bike geometry was capable of and it hadn’t let me down, no matter how extreme the conditions. It had been faster uphill than the mountain bikes in the race, and the Lauf fork and stable ride meant it wasn’t far behind on the descents too. It was the best of both worlds. The newly named Kegety had showed itself to be one tough, fast, capable adventure machine in the most extreme event I’ve ever ridden.